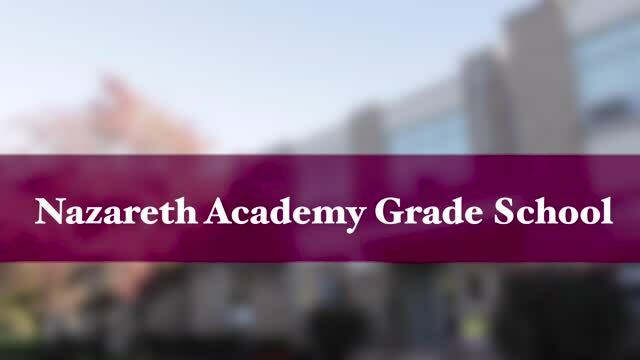 Nazareth Academy Grade School, founded in 1941 by the Sisters of the Holy Family of Nazareth, is a private co-educational Catholic School for students in grades one through eight. Our mission is to spread the Kingdom of God’s love by creating a family-friendly environment in which we invite students and their families to discover God in everyday life events and to be an integral part of the Nazareth family. We are committed to promoting Christian morals and academic excellence, and to demonstrating, through our students’ personal engagement in service projects, God’s love and care for the poor and others in need. TAKE A TOUR WITH US ! Each child is created in the image and likeness of God. Our children can become true reflections of God’s love by imitating the Holy Family of Nazareth. The family’s supportive involvement in their child’s school experience is critical for that child’s happiness and success. An environment of love helps children grow and develop to their potential. The education of the whole child – intellectually, artistically, spiritually, morally, socially, and physically – cultivates productive and compassionate members of society. Children are entitled to an education in surroundings in which they feel safe and respected. Each child’s learning style and personal achievements should be valued and acknowledged. We are building God's reign of love in our world, step by step, moment by moment in this place. The more we recognize God in the daily environment, the more compassionate and caring we will be. Appreciating diversity and understanding other cultures, races, and religions are values that should be encouraged and modeled. A challenging and evolving curriculum is a driving force behind the school’s success and longevity.